We took a long weekend trip a couple of weekends ago to spend some time in San Antonio with Drew's side of the family. 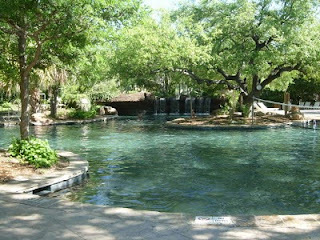 We had a wonderful time and the resort we stayed at--Hyatt Hill Country Resort and Spa--was amazing! There was enough to do there that we didn't even have to leave! But, we decided to go to Sea World on the first day we were there--Friday. and Drew and I rode with him. Luke found some new friends. Drew and Luke watching a water skiing show. Drew and Mitchell AFTER a river tubing ride. We had a GREAT time at Sea World and are looking forward to going back in a few weeks with my brother Jeremy, sister-in-law, Brandy and nephew, Traber! Here are some cute pics of our nieces, Lauren and Audrey, playing in a really cute childrens' area of the zoo. The children's area of the zoo even had a sandy beach and pool area where kids could play. It also had an indoor interactive area with an air-conditioned nursing room (this, I have found, is a very rare thing). That definitely came in handy around Luke's lunchtime. I thought this picture of Erica was cute! We spent the rest of the weekend at the Hyatt Resort Grounds. There was SO much to do there and the grounds were beautiful. They also had many family-oriented planned activities, such as a photo scavenger hunt, and, my favorite, smores at the fire pit nightly! 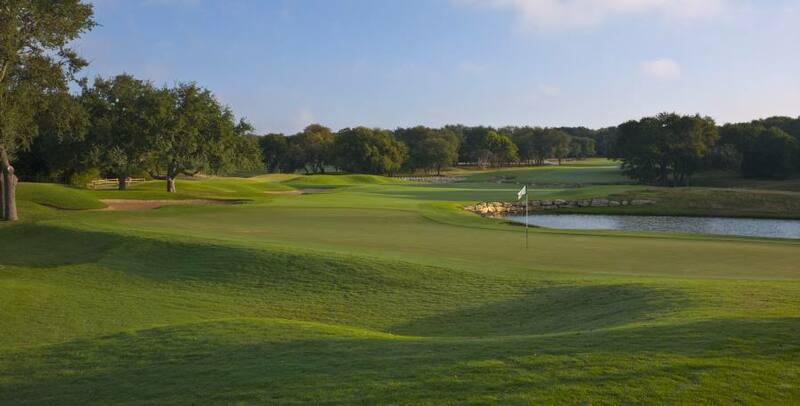 As a matter of fact, on Friday night, when we played twilight golf, our round finished at 8:59p. I was very concerned, as I knew the smores fire-pit was going to shut-down at 9pm. But Drew saved the day--he drove the golf cart VERY quickly over to the fire pit, so that I could make sure I got one. :-) YUMMY! One of the best features of the resort was their lazy river. It was so relaxing to float at night--the entire "river" was tree covered and really did seem like a river--so peaceful! Below is a picture of one of the pools, which is connected to the lazy river, during the daytime. Thank you to the Sugar Land division of our family for a wonderful time in San Antonio! It looks like you all had a great time there! Luke looks like he is really interested in watching the show!!! The Lazy river looks like it would be lots of fun and a great way to relax!